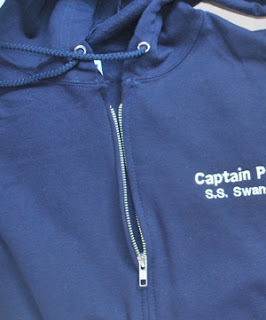 Zippers - even plastic ones - and boats just don't always get along. We always got ones with big heavy-duty zippers, but salt, dirt, sand in them would cause them to freeze or “jump track” in no time. More than once, I'd get our soft cooler out to use it and would discover that the zipper was stuck. Dave would use a spray bottle of fresh water and lots of white vinegar to dissolve the crud, and sometimes get the zipper off track in the process. The worst was when the zipper on my camera bag froze . . . with the camera inside. Couldn't use water on it, so had to cut it apart and destroy the bag. I was determined not to lose another bag this way (and Dave wasn't wild on spending an hour or two "unsticking" zippers, either). I discovered a great product called ZipCare and have been using it ever since on pretty much every zipper we have - and we haven't had another one freeze OR come off track. 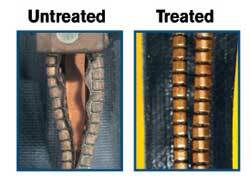 The photo at right is from the Zip Care web site - I no longer have an "untreated" zipper to show as a comparison! A bottle is about $5 from Amazon, which offers free shipping if you buy it with something else to total $25 or more - making it a good add-on when you want something else that's almost $25. The company makes several zipper lubricants, but I've only used the liquid one so can't vouch for the others. The nice thing about it versus some other zipper lubricants that I've tried (and not liked) is that it doesn't attract dirt (I can vouch for this, having used it on our tent that then went through a nasty dust storm in Utah). 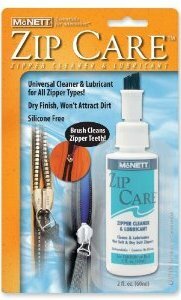 Zip Care has a brush applicator - you brush the zipper (with the bottle closed) first to get rid of dirt or salt, then open the bottle, squeeze it so the liquid gets on the brush and brush the liquid down into the zipper teeth. Run the zipper pull up and down a couple of times to get it in all the nooks and crannies, let it dry and it's ready to go. I like the liquid as it really gets down into the teeth - something I've had a problem with in using other zipper lubricants. Using it on every zipper we have - day packs, fanny packs, camera bags, toiletry bags, wet suits, Lycras, sail covers, bimini, dodger and probably some other stuff I'm forgetting - and putting it on the stuff that gets heavy use every 3 months, other stuff maybe once a year, a bottle lasts about a year. 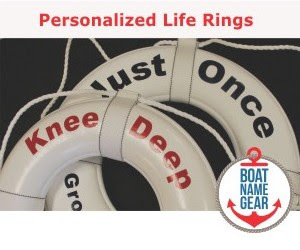 In the last few months, I've seen numerous high-end tent, backpacking and wet suit companies all recommending Zip Care to prevent stuck zippers and costly repairs. 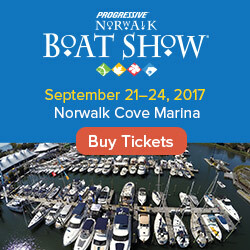 I do, too – and it’s a great fall project if you store your boat for the winter, so you won’t have zipper problems come spring!